The picture on the left (below you can see an old photograph of the same scene) shows the main street of Crosby Ravensworth, largest of the six parishes in the area, which includes all the upper reaches of the Lyvennet Beck, and over the watershed to Shap Wells Hotel, west of the M6. 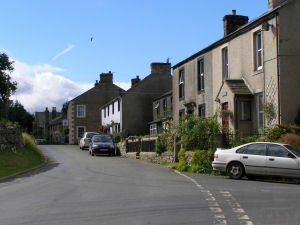 There are three small villages: Crosby itself, Maulds Meaburn and Reagill, with a number of scattered farms, but the total population is only about 550. Apart from ‘service occupations’, such as teaching, contracting, hospitality and driving, the only main occupation is still agriculture. A number work from home. Some 15% are Senior Citizens, some of whom have come into the area to retire. Our Church School was built in 1963 to replace the three old schools and it has been extended twice since. It now includes King’s Meaburn children and there are around 46 on roll. There is a public house in the village but we have no shop. 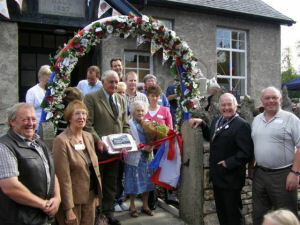 The Village Hall (seen on the left), which was recently refurbished, is well-used by many organisations and groups. There is a flourishing Art Group which meets weekly, badminton, a dance club, nursery and regular coffee mornings which raise funds for various charities. There is a well-attended First Responders group which is effective as Paramedics can take up to 25 minutes to come from Penrith. The Parish Archive has its own dedicated building and there is a thriving History Society. A Farmers’ Market is held 3 times a year in the Hall, the third time being a Christmas Market with refreshments provided by the PCC and volunteers. We can proudly boast of having an Agricultural Show every year, the only one in the Leith-Lyvennet Parishes, which has run for over 150 years almost continuously. A local photographer, Mike Angelo has some photographs of this year’s show. The W.I. is still going strong and is held in the Meeting Room of the Chapel, monthly. Every spring there is a “Crocus Walk” in aid of Breast Cancer Charities around the village fields and woods, which attracts many people. 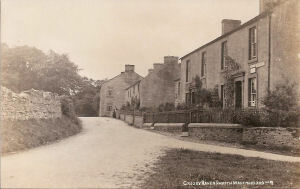 Maulds Meaburn is a small village next to Crosby Ravensworth and within our parish. Their village hall has not at this time been completed, but the villagers have regular monthly coffee mornings to raise funds for the village hall and charity. The website, http://www.mauldy.supanet.com/ shows pictures of this lovely village. There is a monthly news magazine called Lyvennet Link, which covers the villages of Maulds Meaburn, Crosby Ravensworth, Kings Meaburn and Reagill, full of ‘what’s on’. and a précis of Parish Council Meetings, as we also have a very active Parish Council. We have a Community Plan in place, which also shows the hopes of the people for the future, which are too numerous to show here.